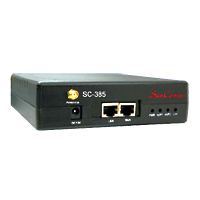 SC-385 is a 2-channel VoIP GSM Terminal for call termination (VoIP to GSM) and origination (GSM to VoIP). It is SIP based, compatible with Asterisk. It will allow you to make 2 calls simultaneously from VoIP to GSM networks or from GSM network to IP VoIP devices. If the SC-385 is registered to an IP PBX or Wifi IP PBX as Extension Numbers, users can extend IP Phone application to GSM Mobile Phone for VoIP GSM connection. 50 sets of MOBILE -> LAN routes setting. Voice response for setting and status (dial in from mobile). For call termination (VoIP to GSM) and origination (GSM to VoIP). Standard SIP (RFC2543, RFC3261) protocol, communicates with other gateway or PC. All functions can be set on web.